Never Forget a Dose Again with the 4 Alarm Pillbox Weekly Pillbox System. 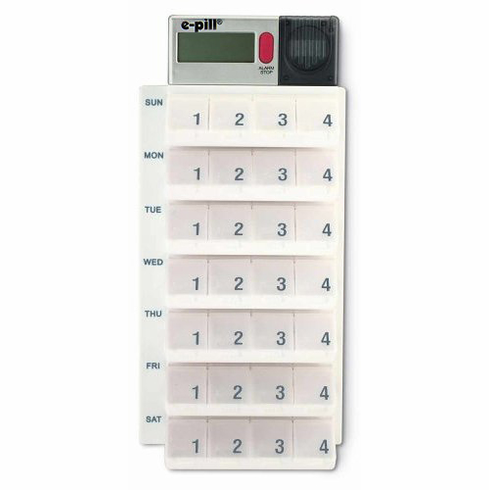 This Weekly Pill Box Organizer Rack comes with a Timer that can Alarm up to 4 Times every day. Seven pill boxes each have 4 compartments, and they can fit in your pocket or purse. The rack can be wall mounted (screws are included). How-It-Works: When the alarm goes off, the device will beep and a message will flash on the screen telling you which pillbox to take. Simply press the red stop button to shut off the alarm. The alarm will automatically reset and go off at the same time tomorrow. No reset is required. If the stop button is not pressed, a missed pill event will show on the display. To take your pillbox on-the-go simply slide off today's pillbox from the pillbox tray and slide it on to the Pill Timer. The timer/pillbox fits in your purse or shirt pocket.